See Sarah Swatch: Guest Post from Chelsea! Hey all! I'm Chelsea from over at Nailed and I'm thrilled to be guest posting here today! 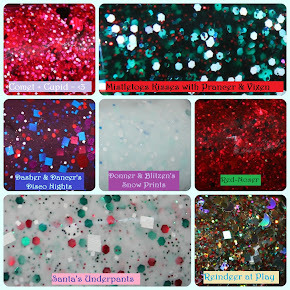 When I set out to pick a polish for my guest post for Sarah, one word instantly came to mind: GLITTER. It's what Sarah would want. ;) So I picked an awesome one to show you: China Glaze Fireside Glow, a rose gold holographic glitterbomb. Fireside Glow was an Ulta-exclusive holiday polish last year. Seeing that the new "Ulta-exclusive" OPIs were blatant rebottles really reminded me of how awesome the CG Ulta exclusives were. They were not only beautiful, but actually exclusive! Fireside Glow does remind me a bit of I Herd That from the new On Safari Collection, but they're just similar ideas, not dupes. I Herd That has much more gold glitter and the coppery glitter isn't as rose-toned as it is in Fireside Glow. I used three coats here and the formula is very nice and cooperative. I didn't even have to do any clean-up on my left hand, which is always a huge plus! If you come across this polish--or any of the other two Ulta-exclusive CG holiday polishes--online or in a swap, I'd say they're well worth picking up! All of them are truly gorgeous. Thank you Sarah for having me and I hope you all enjoyed some adventures in glitter with me today! Ooh great post Chelsea! This is lovely!